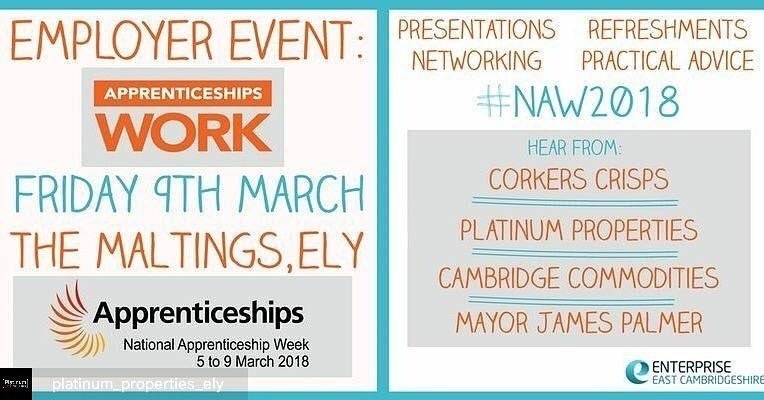 ‘Apprenticeships work’ is the message coming from business and public sector leaders involved in Enterprise East Cambridgeshire’s newest event taking place during this year’s National Apprenticeship Week. Key speakers for the free to attend event, taking place on Friday 9th March at the Maltings, Ely, will include Mayor of Cambridgeshire and Peterborough, James Palmer and Corkers Crisps’ Caroline Bosworth. The day will include practical advice sessions plus a wealth of information for businesses wanting to find apprentices and the funding options available to them. Head of People, Projects and Engagement at Corkers Crisps, Caroline Bosworth, said: “In 2017 we surpassed the milestone of employing over 100 people. This was achieved within seven years of forming the business which we are hugely proud of. Platinum Properties and Cambridge Commodities also boost the roster of speakers for the lunchtime event. “At Platinum Properties we believe in the constant development of the company, our services and our people” says Maria Morgan, Managing Director of Platinum Properties. “Our team is comprised of highly experienced well-regarded industry professionals, some whom started their careers as apprentices themselves. On the event, Councillor Lis Every, the Enterprise Skills Champion for East Cambridgeshire District Council stated that: “The Apprenticeship Works event will support local businesses to develop their workforce, access new talent and consider new ways of working. The day will also include refreshments and a light lunch for all visitors.